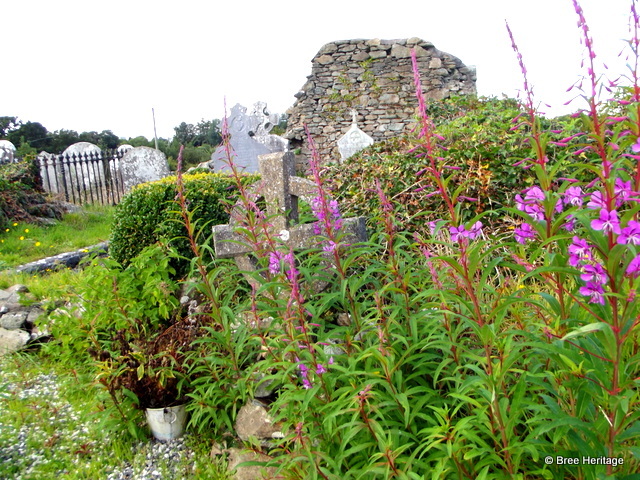 In the shadow of Bree Hill lies the small and ancient cemetery of Ballybrennan (location). It currently presents as a grass covered graveyard with the much degraded remains of a stone-built church near its centre (RMP 031-007). There is at least one decorated medieval grave-slab, located in the north-eastern corner of the graveyard, along with a number of small stone crosses of indeterminate date. The churchyard also has a fine collection of mid-to-late eighteenth century grave slabs. 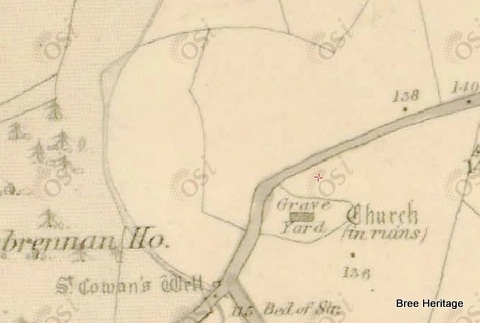 The graveyard has obviously been used as a burial ground for a very long time as its ground surface is considerably higher than the surrounding fields. This height difference is a result of the sheer number of people who have been buried here over the centuries. 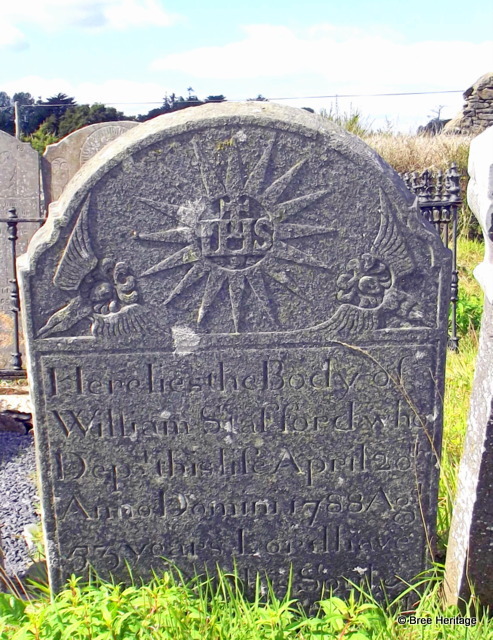 These interments include at least six priests with the earliest decipherable headstone being that of Father Robert Sutton from Ballyhogue who died in 1733 (Shiel 1921, 115). During the medieval period (c. 1169-1540 AD) the church at Ballybrennan formed the focal point of the now defunct parish of Kilcowanmore (St. Cuan’s big church). This parish encompassed the modern day townlands of Ballybrittas, Raheenahoon, Ballybrennan, Curraghnabola, Carrigunane, Tomfarney and Sparrowsland. The church was a possession of the Knights Hospitallers whose priory was located just a short distance away at Ballyhogue. The Hospitallers were a religious order of knights whose origins lay in the holy land where they protected pilgrims and fought the Saracens (Muslims). In Ireland they were entrusted with defending the Anglo-Norman colony from Irish attacks. Kilcowanmore was granted to the Hospitallers by the Keating family and in 1348 Fra (Brother) John Longport of Baliscaok (Ballyhogue) was in receipt of the church’s tithes (Byrne 2007, 259). The Knights also owned property around the church, which they let to lay tenants. For example in 1338 they rented land at Kilcowanmore to Thomas de Sautes, while lands at Rathnegwe (Raheenahoon) and Ballysleve (location uncertain) were also granted to Walter Furlong (ibid). The church at Ballybrennan is dedicated to St. Cuan and there is an associated holy well that lies roughly 75m to the southweat of the graveyard. 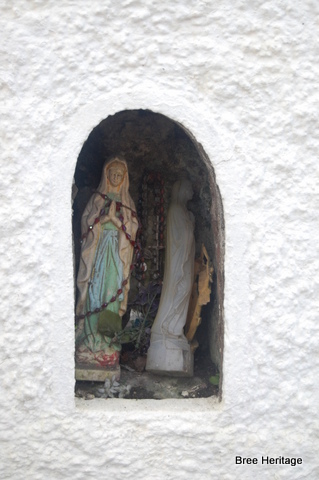 The well, which was incorporated into a grotto dedicated to the Virgin Mary in the 1950s, was an important place of pilgrimage right up until the 1840s when it was visited annually on the 3rd of February (Culleton 1999, 207) or ‘St Coouan’s day’. The Saint Cuan venerated at Ballybrennan appears to be St. Cuanan Glinne of Moville in Co. Down, as both the Martryologies of Tallaght and Donegal describe his feast day as the 3rd of February. He became abbot of Moville monastery sometime after 731 AD and this is where he died in either 742 AD (Annals of Four Masters) or 746 AD (Annals of Ulster). Little is known of his early life or where he was born, but is likely that he founded the church at Ballybrennan before he became abbot of Moville. This would suggest an early 8th century AD date for the church’s foundation. 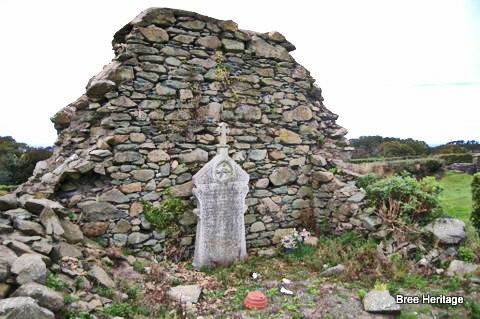 Saint Cuan has a strong association with Bree parish as there is also a church site in Barmoney townland, which is dedicated to him (Kilcowanbeg, RMP 031-038). 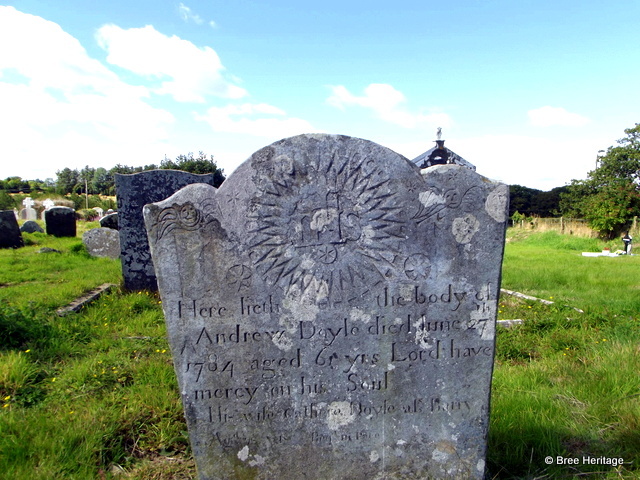 The graveyard has a large number of fine 18th century headstones including a number belonging to people killed during the 1798 rising. 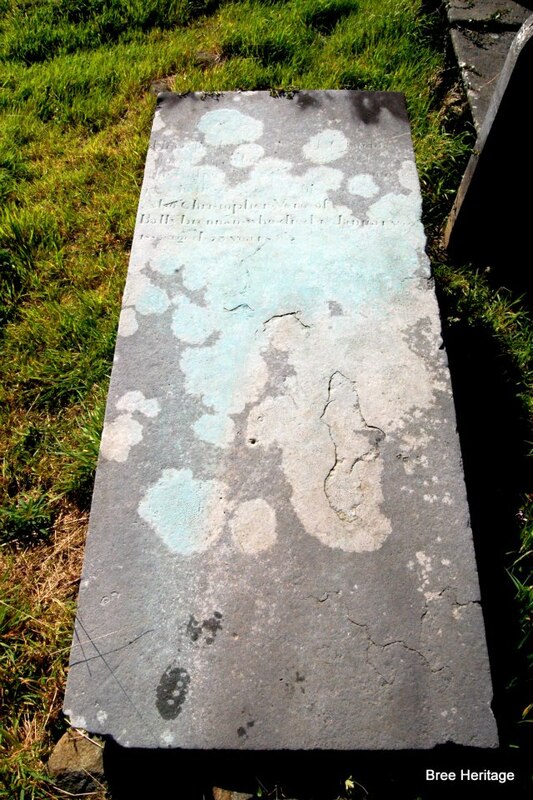 The latter include the badly worn tombstone of Charles Vero of Ballybrennan house, a local magistrate who was killed by the rebels in Enniscorthy. The text below is a late 19th century legend about Ballybrennan church that first appeared in the Wexford People and was then reprinted in Canon Sheil’s History of the Parish of Bree. ‘There is still extant a tender legend about the bell of an unusually sweet tone which the monks rang for Vespers each evening. When Cromwell scattered the monks and wrecked the Church the bell disappeared, but at twilight, the legend says, its dulcet tones still continued mysteriously to steal out on the hill and dale round Kilcuanmore until the Cromwellian landlord, a bad man, died and was buried in the walls of the ruined Church near St. Cuan s grave. From that day the bell was heard no more. The blessed spirits and their bell fled from so foul a desecration.” The stranger’s grave was closed, and hushed for aye that swelling sound, a sad and solemn stillness fill the ruined walls around. No more the spirit band was heard in joyous notes to sing above the ivy-covered ruins beside the sacred spring, with dismal sound the moaning wind swept o’er the ruined pile, Shivering the grass on Cuan’s tomb, and whistling through the aisle; No more upon the evening air is heard the silver swell, the charm had fled, no more was heard the pealing vesper bell.’ (Sheil 1921, 115-116).